Another DQ is upon us and for a whole year, the Outback's had the same lady in its top spot! Will Lilith make it 5 for 5? I suppose we'll see, won't we? I will try! Me, please! Due to some scheduling conflicts, the DQ has been reset for this coming Sunday (Oct. 28) at 8pm by the Eastern Clock. Also to note, the activity requirement is being waived for this Diamond Quest...if you're an Emerald (active, inactive, or retired), and you want to participate, please come out and fight! Location: Her home or dojo, both found bordering the New Haven and Battlefield Park districts. Oh cool, you don't mind that I've been lazy. The powers that be have declared this Diamond Quest to be fought with slugfest rules so you better bring your mouth-guards cause you're likely to get kicked in the face. On October 28, 2018, seven Emeralds met up at the Lantern Estate to fight at the behest of Lady Jacquelyn Orwell Lantern III in: A GHASTLY CROWN--Diamond Quest XCV at Orktoberfest! Lilith was the defending Diamond, but she didn't make it out last night unfortunately (maybe she didn't have anything fancy to wear?). Or maybe that was fortunate for the field of seven competitors who faced each other in the ruins of the Lantern Estate's garden ballroom surrounded by the vast pumpkin patch at the edge of Orktoberfest -- and the ghastly forms of the dancing dead, who were not above hindering those fighters they bet against. 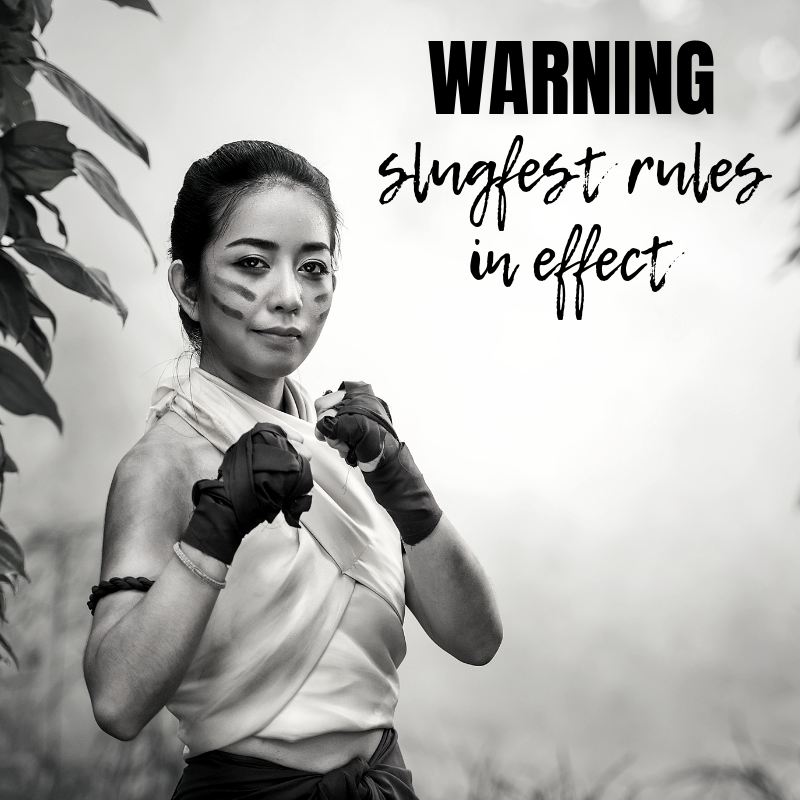 To make it an extra special occasion, the fighters were scored using Slugfest rules in honor of Orctoberfest, making for an especially brutal night. You can see the full bracket here! King and Jewell met in Ring Kestrel and started off with a bang with double jabs! Then Terry took the lead with a wicked snapkick, ending Jewell’s attempt at trying to clock her in the jaw. They traded jabs again before trading vicious leg sweeps to end the match 5-3 Terry. Matt met Kheld in Ring Silver and raced ahead, scoring four points unanswered until the fifth round when Kheld returned jab for jab. Unfortunately, it was too late for the big guy and Matt walked away with the win: 5-1 in five. In ring CherryCola, The Anvil faced off against Badside's badass Jake, who showed why he has a reputation for king of the Duel of Fist rings by running away with this duel from the opening jab to the crazy flip at the end to shut out Kruger and win 5-0 in four rounds. While everyone else was battling it out, Eden had the bye so she had a cherry coke. In the winners bracket, Old Man Matt met the Jake Thrash in Ring Odin and wow! What a fight! By round six, Jake lead 4-1. Only four rounds later, they were tied and then Matt finished his turning of the tide with a jab in the eleventh to win 5-4 against the brewmaster. Fresh from her cherry coke, Eden faced King in the aptly named Ring Honey. Terry started off strong but Eden quickly caught up and took the lead. She kept it until Terry tied with her in the seventh round and much like Matt, turned around and stole the win with a jab in the eighth to beat Eden 5-4. Over in the losers bracket, Kheldar and Kruger met in Ring Regicide. This was just not a good night for The Anvil as the big guy hammered him with a snapkick, a jab, and a vicious uppercut to get the only shutout in three rounds for the night! Nice job, Kheld! Jewell had the bye so she nursed her bruises from Round 1 by having Fistmelda serve her a Badsider. Round 3 was the semi-finals for the winners bracket, where King and Matt faced each other in the aptly named Ring Blood. This match see-sawed with King taking the lead, Matt tying it up, etc. It all changed in round five when Matt took the lead and kept it to win 5-2 in eight rounds. Over in the losers bracket, former mentor/mentee Jake and Jewell met in Ring Warriors. They traded a few blows (including awesome uppercuts in round two), but the Empress showed she had learned a thing or two from Jake and beat him 5-2 in four rounds. Nearby, Real RhyDin teammates Eden and Kheldar met for a tough battle in Ring Hydra. Kheldar took an early lead but Eden tied things up by round three. Then they traded some jabs and legsweeps, and then more jabs before Kheld cleaned Eden’s clock with a final jab in round nine to win 6-5. Matt chilled in the winners bracket and got punched in the face by Fistmelda for being sassy. While Terry tried to avoid the cameras as she had the bye, Real RhyDin teammates Kheldar and Jewell met in Delta. Jewell started out strong with a head turning spinkick and didn't let up, pummeling the big guy for a perfect shutout, 5-0 in four rounds. Matt sat around sad because Fistmelda had punched him. Coming off her win against Kheld, Jewell met King in Ring Mistletoe for a rematch. Things went a bit differently this time as Jewell started off strong and finished the match quickly with an uppercut, winning 5-0 in four rounds and therefore winning the losers bracket. First, Jewell and Matt met in Ring Silver. Except for one round, Jewell lead the entire time to win 5-3 in seven rounds. Unfortunately, they had to have an instant rematch in Ring River. Matt stole Jewell's early lead and kept it until Jewell tied things back up in round seven for sudden death! Matt ended the fight with a legsweep against Jewell's ambitious spinkick, earning himself the win and another diamond. Congratulations Matt Simon on winning Diamond Quest XCV! Also of note: Eden Parker won season tickets to the next baseball season at Kitsune Stadium courtesy of the Wrecking Crew! The Duel of Fists staff would like to recognize Jewell Ravenlock for back to back shutout victories (both in 4 rounds!) as well as Kheldar Drasinia for a three-round shutout! In addition, everyone's favorite half-orc returned to the rings with a four-round shutout of his own! Talk about Slugfest! With Matt taking the Diamond last night, he can no longer claim MoonBeryl; tournament details to find a new holder for the yellow opal will be announced soon.